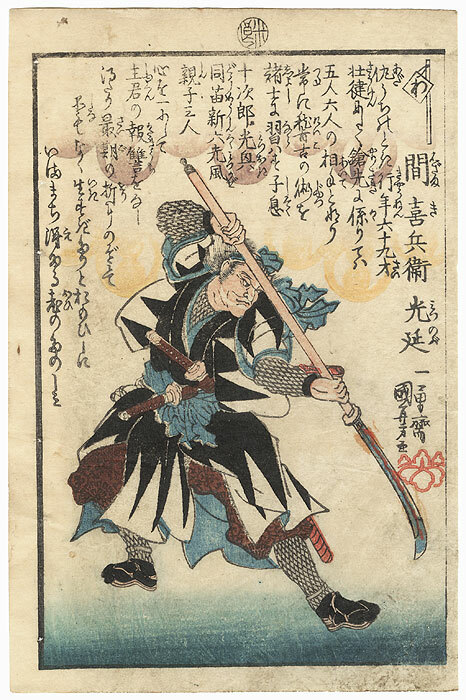 Chushingura ehon - Handsome Kuniyoshi portrait of one of the 47 ronin from an illustrated book (ehon) of the "Chushingura" or "Storehouse of Loyal Retainers," dating from 1847 - 1848. These handsome designs are carefully detailed with soft bokashi shading at the bottom of the image and the inverted comma crest of the ronin's leader, Oboshi Yuranosuke, running across the top. The prints are presented in the iroha order of the kana syllabary, with a little diamond at upper right featuring the syllable. We have never before come across these interesting designs. A nice choice for a Kuniyoshi collector or anyone interested in this timeless tale of honor and revenge. Condition - This print with excellent color and detail as shown. Stitching holes at side. Slight soiling. Some prints have slight rubbing or a few creases at edges, or a few marks. Please see photos for details. Generally in good condition overall.